Here’s your opportunity to make a difference! Your participation is needed for our 25th annual KinniRiverCleanUp at 9:00 a.m. on Saturday, April 27! 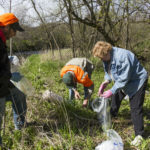 Last year 170 volunteers showed that they care about the beauty and health of the Kinnickinnic River and we hope you will be part of an even larger turnout this year. Click here to fill out Volunteer release form! This is a wonderful way to explore the Kinni while collecting trash along its banks and making a difference to keep the Kinni cold, clean and free…forever! 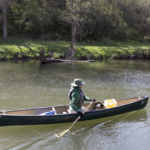 If you’re an experienced paddler, you can also clean up the river by canoe or kayak. Kinni Creek Lodge and Outfitters is again generously providing kayaks and transportation back to their facility for experienced kayakers. 9:00 a.m. Check-In – Turn in one completed Participation Form per volunteer and receive your map and work assignments at Veterans Park. Enjoy fresh coffee donated and served by WE Market Co-op of River Falls! 9:30 to Noon – KinniRiverCleanUp. After you have completed your cleanup section, please bring your trash/recyclables to United Methodist Church for disposal and join us for lunch from 11:00 a.m. to 1:00 p.m.
11:00 a.m. – 1:00 p.m. Lunch and treats will be provided by River Valley Catering, Best Maid CookiesandViking Coca-Cola, Leitch Insurance Agency, Ameriprise Financial – Wayne Wulf, CFP®, ChFC®, Bremer Bank–New Richmond,Catalyst Sports Medicine, Edward Jones – Nick Jackson, CFP®, Edward Jones – Brian McQuade, AAMS®, Edward Jones – Vince Seidling, Edward Jones – Jim Williamson, Leitch Insurance Agency, Randy Cudd and Associates Keller Williams Realty Integrity and served by River Falls Rotary. Garbage bags will be provided by American Rivers. Tires will be recycled by River Falls Tire. Many thanks to our sponsors for their generosity! We strongly suggest that you wear work gloves and work boots. If you are going to be in the water, please dress appropriately. Long sleeve shirts and long pants are recommended for the protection they provide against the sun, thorny or poisonous plants, and biting insects. Wearing hat and eye protection is also recommended. You must register for this event by Monday, April 22. This gives us enough time to plan out what areas will be assigned to whom. Also, make sure to fill out your volunteer release form.